In fact, it is not forbidden to mark the Nakba in Israel, and the so-called Nakba law does not prohibit the marking of the Nakba. 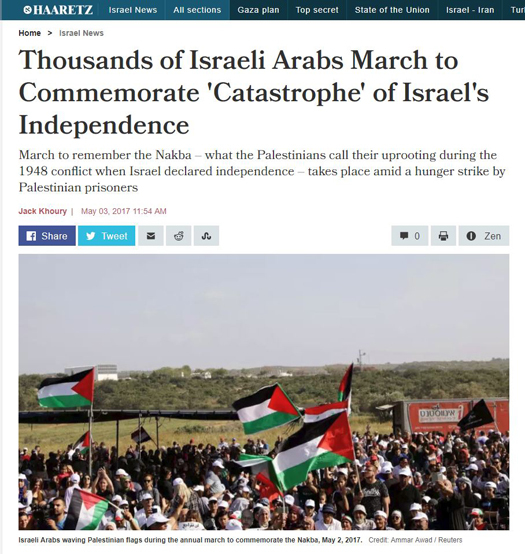 Indeed, as Haaretz reports, every year thousands of Arab citizens of Israel freely march to commemorate the Nakba. Last year’s march involved a dispute with the police over timing and nature, but not content. The police did not maintain that it was illegal to mark the Nakba, and the march went ahead with thousands of participants, with a slightly altered route to avoid an Israeli war memorial. 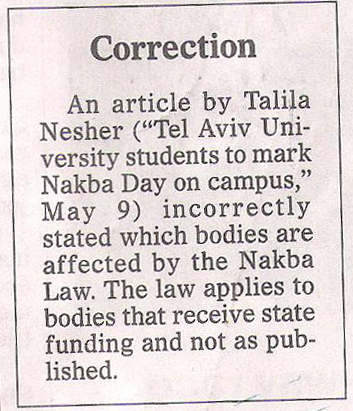 Moreover, if it were illegal to mark the Nakba, Haaretz itself is in violation of the law. Rather, the law narrowly enables Israel’s Finance Minister to withhold government funding from state-funded bodies engaged in activities which reject the existence of the state of Israel as a Jewish state. The law does not affect private individuals or institutions or organizations which do not receive government funding. Nor does it prohibit bodies which do receive government funds from marking the Nakba. It merely gives the government the right to withhold funding if the state-funded body does mark the Nakba. I am not comparing the Holocaust to the Nakba, neither in scope nor intent. However, should remember that Israel, too, via the offices of Culture Minister Miri Regev, is doing everything in its power to deny funding for organizations that nonetheless wish to commemorate the Nakba. In addition, editors commendably appended the following note to the bottom of the article alerting readers to the change. CAMERA continues to urge Haaretz to correct the last paragraph. For additional corrections prompted by CAMERA and Presspectiva, CAMERA’s Hebrew site, please see here.